CITSM – Certified Information Technology Scrum Master is the one who facilitates product development team that follows scrum frame work. He takes care of how the information is exchanged. There is an unawareness amongst the people that Scrum Master and Project Manager are same. Realistically, both have no connection. The project manager is a leader and a decision maker who manages the project and the team and is accountable to achieve project objectives. The Scrum Master is similar to that of coach who acts as a facilitator between the project and the customer but never manage a team. He supports the product owner, coaches the team, and makes sure that the processes of Scrum are followed to retain customer satisfaction and confidence. candidate needs to score 70% (56 correct out of 80 Questions) to pass the exam. The total duration of the exam is 1 hour 30 minutes (90 Minutes). Exams are online and can be taken anywhere anytime. All you need is a reliable internet connection. The exam is conducted in a closed book manner. No external sources of information may be accessed during the exam. 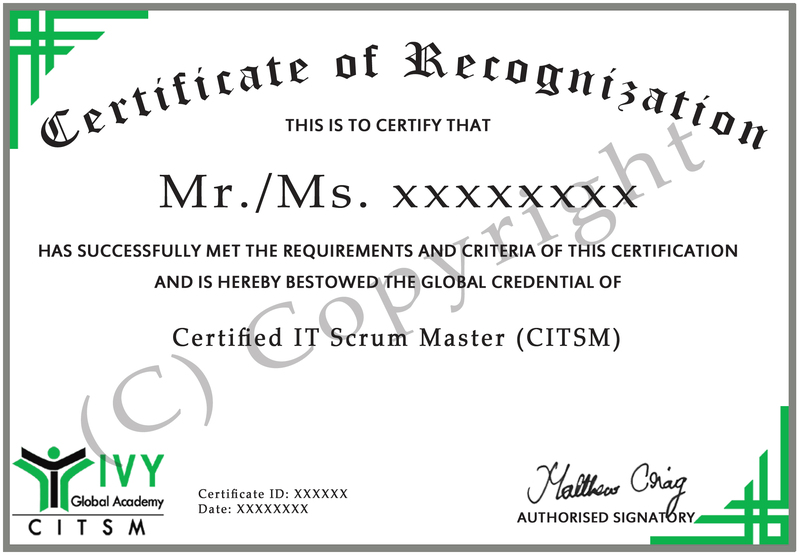 The Certified IT Scrum master (CITSM)–Certificate is valid for life.